Paris is a cliché. Such is true of anywhere that markets itself as the "city of love." It's one of those metropolises we're simply programmed to adore, with its sweeping boulevards, and its limitless wealth of wine. But picture all those kitschy corner bistros and those quaint boucheries typically overrun with women smoking long, delicate cigarettes, and imagine, instead, a crowd of prepubescent-human-sized teddy bears. Strange, oui? As it turns out, this image is not the stuff of a bad shrooms trip, but rather, a Parisian reality. 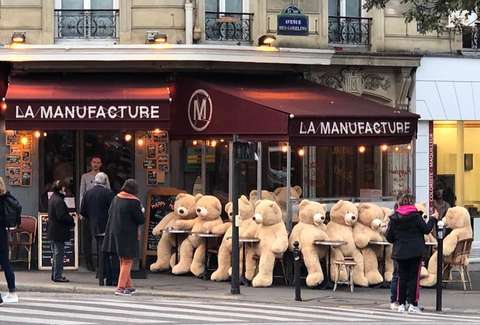 All over the Gobelins neighbourhood in the 13th arrondissement, folks are reporting oversized teddy bears seen gathering on metro platforms, on cafe terraces, at the pharmacy, and inside of a number of cars, according to a report by Lonely Planet. This is, of course, somewhat unsettling: Throngs of sixth grader-sized stuffed mammals do not typically operate motor vehicles and fill prescriptions. 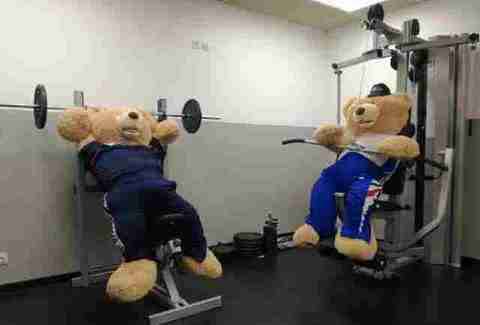 Bears get swole. | Bears get swole. After much deliberation, however, local law enforcement were able to track down the source of the bear-charade: a cheery local bookseller who goes by the name, Philippe -- which makes him sound a little like the wise, gentle uncle in an animated Disney film. Apparently, the pseudo fairy godfather has been commissioning folks all over the area to assist him in distributing the bears far and wide. At this time, there are more than 50 throughout the city. 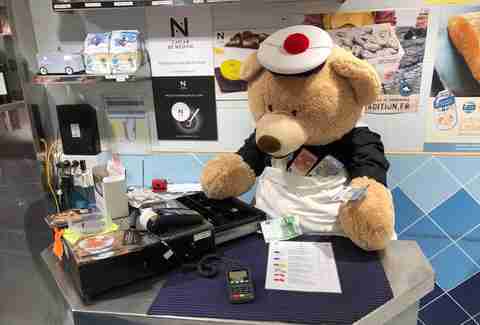 And to track their Parisian adventures, he even mans a Facebook page titled Les nounours des gobelins (the teddy bears of Gobelins). Some appear solo, while others crop up in cliques, and they tend to grow in number by the day. This is perhaps the most tender prank that France -- nay, the world -- has ever incurred. That said, it rains a lot in Paris, so the bear display may grow less aesthetically pleasing by the day. Next time you hit the city of love, please be sure to carry an extra umbrella.